You know the time of year where we are stealing our kids' leftover Halloween candy, and panicking about what to give people for Christmas; but still manage to squeeze in one more holiday to say we are all thankful for what we have, and then a day later go buy a ton more stuff. That's right, I'm talking about Thanksgiving, and if you didn't figure that one out then you definitely didn't steal enough candy. This past week end I jumped the gun on Thanksgiving a little and cooked my family a turkey dinner. Partly because I was in the mood for turkey, and partly because I hit up our local farmers' market on Friday and got some great green beans, butternut squash, and red potatoes. As I was preparing the turkey I decided I would share with you my full proof way to have a delicious moist turkey every time, and cook your turkey the easiest most mindless way I have found. Yep, I said mindless. Let's face it you have enough going on without having to check on your turkey every 15 minutes, especially with a houseful of guests. 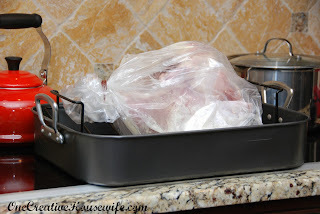 This is my go to method for cooking a 24 pound turkey or an 8 pound turkey breast. It has worked every time and the turkey is always super moist. No basting needed! It is practically set and forget it. 1. Determine how long it is going to take to cook your turkey or turkey breast, and plan accordingly. Butterball has a calculator on their site for this. Once you get that number add 1 hour an 15 minutes (The 1 hour is for when you reduce the temperature to 200 degrees, and the 15 minutes is for resting). 2. Preheat oven to 300 degrees. I know Butterball has 325 degrees on their site, but trust me here 300 degrees is what you'll need. 3. Clean your turkey, or convince someone else to do it for you. If you are stuffing your turkey go for it, but that is not my cup of tea. 4. Spray the inside of the Oven Bag* with cooking spray. 5. Place the flour in the Oven Bag* and shake to coat with flour. 6. Lay the Oven Bag* in the roasting pan. 7. Place the turkey in the Oven Bag*. I place mine breast side down. You won't get the prettiest turkey this way, but it'll be super juicy. 8. Pour the can of broth over the turkey inside the Oven Bag*. 9. Cook the turkey at 300 degrees for time determined by the Butterball calculator. 10. About 30 minutes before your time is up, check for doneness. 180 degrees on a meat thermometer in the thigh, 165 degrees in stuffing. 11. Once the turkey has reached the proper temp you can serve it, or for fall off the bone turkey turn your oven back to 200 degrees and allow the turkey to cook for 1 more hour. 12. Remove the turkey from the oven and allow it to rest for 10-15 minutes before carving. I cheat for the gravy. 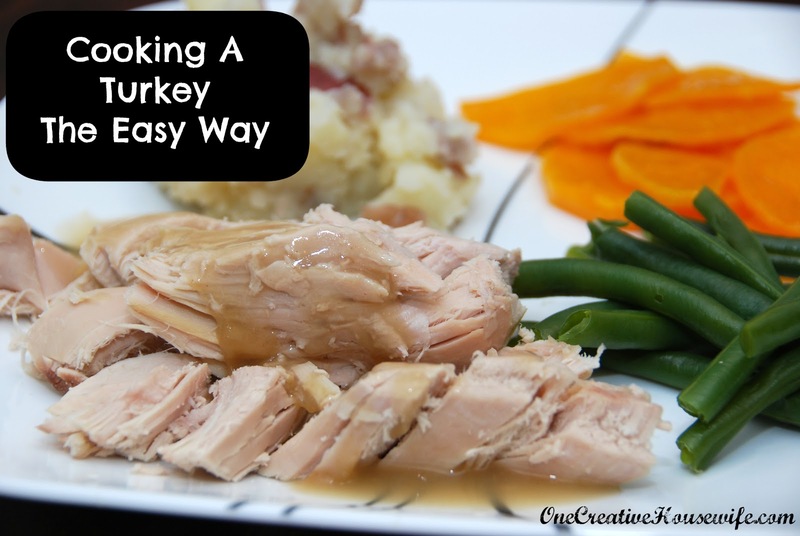 I use a can of Campbell's Turkey Gravy and add drippings from the cooked turkey. I never worry about lumpy gravy and everybody loves it!